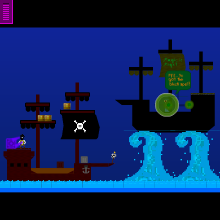 You, as an old pirate, who has left everything (even your loved family) is now back to reclaim something that was once yours by proving that you're able to overcome the impossible... To find the Cursed Sunken Ship. ------------------------ I know RIGHT that the game is a bit hard (which game of mine isn't? ), but it's possible to beat. Please enjoy and leave some feedback! Thank you! ------------------------ If you encounter with any bugs/glitches, tell me! I won't bite.